Flavor the Milk. In a medium pot, bring the 2 cups of milk to a boil. Right when it reaches a boil, turn off the heat and steep the Lapsang Souchong for 5 minutes. It is easiest to do this with a large paper tea filter. After 5 minutes, remove the steeped tea leaves. Set the milk aside. Make the Filling. In a large skillet, warm the olive oil until it shimmers. Lower the heat, then sauté the diced shallot until just translucent. Add the flour to the shallots and oil. Cook the flour for a few minutes, until light brown in color. Gradually add the hot milk to the roux, then continue to mix and cook the sauce on low heat until everything is well incorporated and starts simmering. Add the provolone and parmesan to the simmering white sauce. Let it melt completely. Add the white wine and spinach, again mixing to make sure everything is evenly incorporated. Add the diced chicken, nutmeg, and ground pepper to taste. Set this filling aside to cool. Make the Crêpe Batter. Place all the crêpe ingredients (except the non-stick spray) in a blender, placing the liquid ingredients in first before adding the dry. Blend until the mixture is lump-free and smooth. See Thirsty for Tea for the crepe recipe. Cook the Crêpes. Spray a 10'' crêpe pan with non-stick spray, then place it under very low heat until the pan gets evenly warm. Pour a 1/2 cup of the batter in the center of the pan, then smooth the batter out to an even thickness with a wooden crêpe spreader. Cook the crêpe for a few minutes on the first side, until it releases from the pan. Check to see that the color of the crêpe underneath is lightly browned, then flip the crêpe over to cook on the other side for a few minutes more. Repeat this step to make 10 crêpes. Fill the Crêpes. Place a crêpe on a work surface, then place 1/4 cup of the cooled filling in the bottom 1/3 of the round (the side closest to you), in the center. On top of the crêpe, shape the filling into a 6″ log with a small spoon. Generously scatter some chopped chives over the filling. Fold the bottom side of the crêpe (the side closest to you) over the filling, then fold in the right and left sides towards the center. Roll the crêpe up tightly, in a sushi roll like fashion, upwards (away from you) until you get a cigar-shaped, filled crêpe roll. Repeat this step to make 10 filled, rolled crêpes. Serve immediately, or make up to a few hours ahead of time. If the filled crêpes are made ahead of time, cover a plate of crêpes with a large dampened paper towel, then place them in the microwave to warm for a few minutes before serving. The cheese filling will melt and become oozy again. 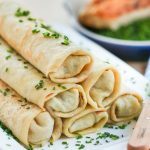 Get this recipe for Chicken & Chive Rolled Crepes at https://www.theworktop.com/guest-posts/rolled-crepes-thirsty-for-tea/.